Does anyone else still have Easter chocolate? Until a couple of days ago, we did. At this point, you’ll be thinking “HOW is this possible?”, given what we know about sugar being addictive, Easter chocolate being especially yummy and in any case, Easter being a whole two weeks ago. I mean, we shouldn’t even be talking about Easter. But yes, we did have some remnants of dark chocolate left and we were really thinking about how to repurpose it. So we were in Selfridges Food Hall, picking up some frozen yoghurt (plain with strawberries and blueberries – it’s the only way, trust us) and came across these Paleo “Scandi Bars” from Upcakes which looked like dark chocolate Reese’s cups but with a coconut-almond mixture instead. The label said they were vegan, gluten free and paleo – which in our minds made them more interesting than the other puddings available. We were determined to try the bars and find out whether they were as yummy as they looked. When we tasted one, the first thing we thought was, “Oh God this is so yummy. And healthier than a Bounty!” and the second thing we thought was, “We could totally make this”. So we made a version that is similar – we added rosewater to make it slightly fresh-tasting, but didn’t add any form of sugar to the coconut or dark chocolate. 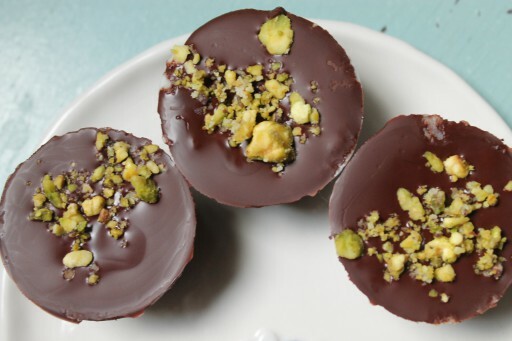 These are a perfect hit for our sugar cravings. You could also add protein-powder (if you’re that way inclined) to make it into a pre- or post- workout snack! Place the coconut in a food processor, and blitz until the coconut is broken down to resemble sand. While the food processor continues to run, add the coconut oil, vanilla extract and salt to the food processor. Keep processing the mixture until it comes together to form a sticky paste. This took us about 5-10 minutes. Add the rosewater to the mixture and blitz in the food processor for a few seconds so that it is fully mixed. Set aside. Using a pastry brush, brush a teaspoon of the melted chocolate in each individual compartment of a mini muffin tin so that the chocolate covers the bottom and sides of each compartment. We used a silicone muffin tin, but if you are using a metal tin, be sure to grease well with oil before doing this step. 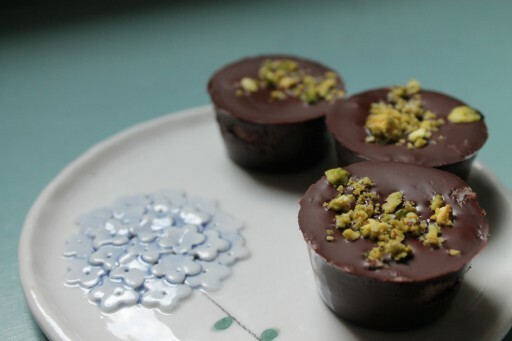 Place the mini muffin tin in the fridge so that chocolate firms up. When the chocolate has solidified, add a teaspoon of the coconut mixture to each compartment of the mini muffin tin on top of the hardened chocolate and press down so that the coconut is packed in. Then add a teaspoon of the remaining melted chocolate on top of the coconut mixture of each compartment of the mini muffin tin. 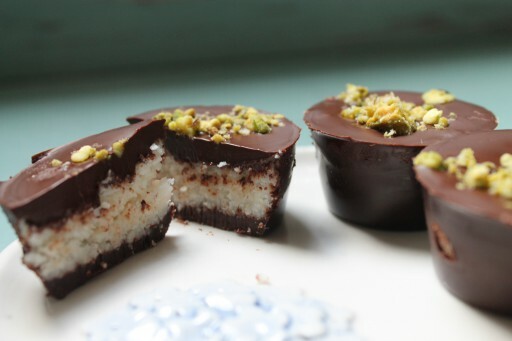 Sprinkle the pistachios on top. Place mini muffin tin in the fridge to firm up. When the chocolate is solid, pop the chocolates out of the mini muffin tin (use a knife to loosen the cups if you did not use a silicon tin like we did) and store in airtight container in the fridge. MMmm that looks delicious! I want to make those now. Thank you! They are certainly delicious, they were all gone very quickly!